House training a puppy is much easier when you have a solid plan to follow. This is usually the first attempt at training that new puppy and dog owners make. And I've heard so many different ideas about how to tackle house training tossed about, that it can be confusing! The most important thing to remember when house training is to be consistent! Inconsistency is confusing for a dog, and leaves him guessing at what it is that you want him to do or not do. ﻿﻿When you first bring a new puppy or older dog home, take him out right away - the stress and excitement of a new environment and the car ride over will trigger him to pee and/or poop. While you will want to let the dog sniff around the house a bit, keep him on a leash. Why? If he finds a nice spot in a secluded room or basement, chances are he'll pee there! By keeping the dog on a leash, you can be sure of preventing this from happening. You know the saying, "An ounce of prevention is worth a pound of cure". The same goes for house training a puppy. If you can prevent unwanted accidents, this stage will go a lot easier. Once your puppy gets into a habit of peeing or pooping in the house (even once a day is considered a "habit"), it becomes that much harder to break. Crate train your puppy or dog right away. Don't wait a week or two to let them "settle in". Have a properly sized crate in a central room of the house before you even bring the dog home, where he can stay for up to 8 hours a day. Don't know how to size a crate? A good rule of thumb is that your dog should be able to stand up, lie down, and turn around in the crate. That's it! Any more room than this and he will pee or poop in one corner, and sleep in the other. Instead of giving free rein while house training a puppy, crate him when you go away, at night and at any time that you can't have both eyes on him. This is not punishment - if you take time to properly crate train the pup, he will enjoy being in his "den". A crate is going to be your best friend when it comes to preventing accidents from occurring. Good thing for us, the majority of dogs and puppies won't soil where they need to sleep. I recommend cutting off water for the evening around 7 p.m. for a puppy, and make sure that the last feeding is by this time as well (puppies shouldn't be grazing all day anyways!). This way, it will be easier for him to hold his little bladder until you let him out in the morning. Of course, the first thing you should do in the morning is take your dog or puppy outside to pee. Take him out on a leash (yes, even on cold winter mornings...) so that you can be sure that he actually did his business, and you can train him to go in the same designated potty area each time. Don't scold your dog when accidents happen! every time you take your pup out, ding the bell! Once the pup pees or poops outside, praise immediately. If you wait until you're back inside before you give a cookie, it will be too late and he won't understand that he's getting it for peeing, and not for coming in the house or sitting in front of you. If you can catch it on time, clap your hands loudly or say "eh!" to startle the pup in the midst of peeing/pooping. Then rush him outside. Don't ever scold the dog for going inside, or you will make him afraid to pee in front of you (think road trips...). If you've missed this opportunity, take a clean sponge and sop up the pee or pick the poop up in a bag. Take the sponge/bag out with your puppy to the designated "bathroom area", and wipe in on the grass. Encourage him to sniff it - he needs to smell the pee/poo outside on the grass to understand it! Inside, you'll also need to clean the area very well or he will repeat that behavior. Don't clean it with bleach, because the smell of ammonia will trigger your dog to go again in that spot. Use an enzyme-based cleaner wherever needed (crate, bedding, kitchen floor, carpet). One great cleaner is Odor-Out, available at Walmart. What About Pee-pads or Paper-training? Believe it or not, the worst thing you can do is litter train, pee-pad train or paper train your dog - he will never learn to go outside. If you want him do his business outside, start training him to do so from the beginning. Some puppies seem to "get it" quicker than others, but all dog can be house trained! It might be a little harder once they've got a habit in place of peeing or pooping in the house, but with this plan, it shouldn't take longer than a couple weeks. If you have an older dog that you are house-training, it shouldn't take much longer. 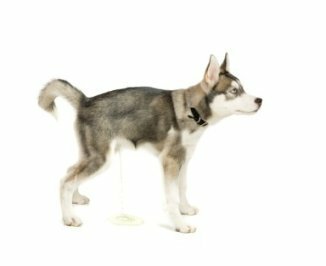 However, if your dog seems to be unable to hold it for very long, it may be an underlying health condition (such as canine urinary incontinence). A quick visit to the vet can rule out any issues. 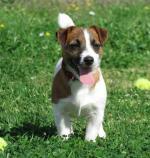 Want a detailed step-by-step guide for house training a puppy or older dog? Check out our new e-book House Training Made Easy. It has the best methods on ﻿ house training for dogs, including crate-training, dog marking, and much more. 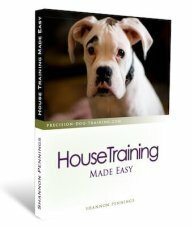 I've put together all of my best house training and crate training how-to tips and advice in one handy e-book that will make your job so much simpler! Teaching your puppy or older dog to go outside can be frustrating, but this guide is meant to take that stress away and turn it into an easy, simple lesson. Click the e-book to get started now!